Light is part of the energy spectrum and is composed of wavelengths of varying lengths. Energy wavelengths just shorter than visible light are in the ultraviolet (UV) end of the spectrum and just longer wavelengths are at the opposite end of the spectrum in the infrared (IR) region. The visible light region is between ultraviolet and infrared. Ultraviolet and infrared radiation are invisible to humans. Shorter wavelength UV radiation is the most damaging, although visible and infrared (heat) radiation are also damaging. Various light sources contain different percentages of UV, visible and infrared light. Daylight contains all three. Fluorescent lights usually combine UV and visible light energy. Tungsten lights usually combine visible and infrared light energy. Newer bulbs vary in the wavelengths they emit. Some halogen lights emit enormous quantities of ultraviolet radiation. Different types of materials are adversely affected at varying rates by light, UV and IR radiation. Degradation occurs when a material absorbs the radiation. This occurs if the molecules of the material are susceptible to damage by the wavelength of the light, UV or IR energy. Organic materials are most susceptible to this form of degradation. For example, excessive light, UV and IR exposure can cause fading of dyes and color shifts in textiles, leather, wood and paper; weakening and embrittlement of some organic materials; and yellowing and cross-linking of varnishes. Generally, the shorter the wavelength, the more damaging the light to the physical stability of an organic material. At a given level of illumination, ultraviolet light (measured in microwatts of UV radiation per lumen of visible light) is the most damaging of all. Light from an overcast sky through glass, which contains high levels of UV radiation, is five times as damaging as a tungsten light at the same level of visible illumination. Traditionally, conservators have recommended that if a museum light source emits more than 75 microwatts per lumen (mW/l) of ultraviolet radiation it requires a UV absorbing filter. In the past year, new recommendations by staff at the Canadian Conservation Institute suggest eliminating UV radiation completely, aiming for under 10 mW/l through the use of window films and UV absorbing light covers. Recent experiments have shown that ultraviolet radiation weakens physical structures, such as causing paper to embrittle, but visible light is more likely to fade dyes and pigments. Visible light levels also should be kept at a minimum. Usually 50 lux (or 5 foot-candles) is recommended for watercolors and textiles; 150 lux (or 15 foot-candles) is recommended for oil paintings, wood, and leather. Most unvarnished metals, ceramics and glass do not require light controls, but staff should judge each piece based on added decoration and associated parts. Not only must the wavelength and intensity be considered, but also the duration of exposure. The total time that sensitive materials are exposed to light directly relates to the amount of damage incurred. Several months of exposure at very low levels can have the same effect as a few days exposure in bright sunlight. 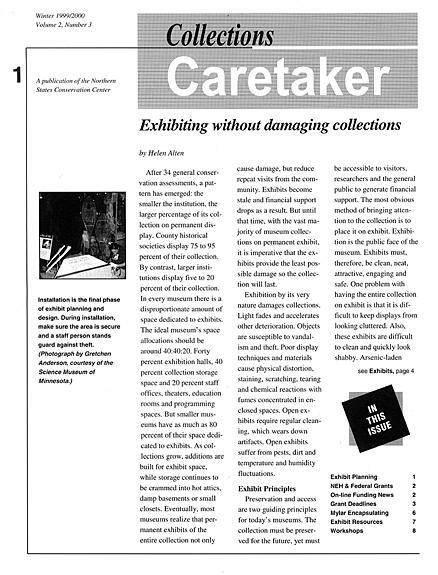 Damage from light is always cumulative; its effect on artifacts cannot be reversed by subsequent storage in darkness. In general, keep your light levels as low as possible. Visible light should be under 5 fc (50 lux) for light sensitive materials such as many textile dyes and watercolors. Less light sensitive material should be displayed at levels under 15 fc (150 lux). If your audience is older, you may want to raise the light levels. When light levels are raised, they must be balanced by decreasing the exposure time. Limiting exposure time techniques include shortening the exhibit time, using visitor sensors to trigger lights on only when the material is viewed, and limiting exhibit times to a few hours on certain days. UV Detecting Beads The beads contain pigments that react with ultraviolet light from the sun, even on a cloudy day, turning them from white (no UV) to colored. Make your own UV light detecting bracelet by stringing the beads on a pipe stem or on a strip of rawhide. Great for teaching UV awareness! 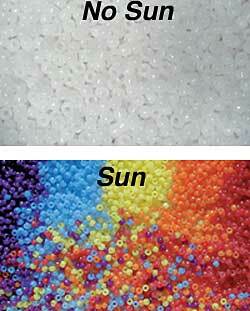 Use the beads to test the UV blocking effectiveness of sunblock, sunglasses, windows, etc. Available in five colors (purple, blue, yellow, orange and red), all beads are pale, off-white in the absence of UV light. The ultraviolet beads will cycle back and forth (to bright colors and back again) over 50,000 times. UV Detector This detector contains UV Detecting Beads inside of a clear plastic bottle. When the detector is shielded from UV radiation, the beads are white. When exposed to UV radiation (between 360 and 300 nm in wavelength), the beads turn purple. This detector can change color thousands of times.